More than 100 representatives from NGOs, local communities, the UN and the government gathered at Himawari Hotel in the capital on Monday to discuss and exchange ideas on climate change adaptation and funding at a sub-national level. Plan International Cambodia yesterday launched its 1,000 Days Nutrition project in Stung Treng province for which it will spend $1.5 million for five years to provide better nutrition to children and women. Today (Tuesday) marks the final day for the EU Commission for Trade to receive the opinions of the EU bloc’s 28 member-states before deciding whether to suspend the Everything But Arms (EBA) tariff preferences for Cambodia. Former CNRP vice president Eng Chhai Eang has urged former opposition party supporters to donate money so that the funds could reach $300,000 in three months to prepare for an arrangement of Sam Rainsy’s return to Cambodia. Cambodian Prime Minister Hun Sen’s visit to China last week came amid speculation that Beijing is seeking to build a naval base off the Cambodian coast, claims the prime minister has denied. An Interior Ministry official has warned of legal action against anyone who continues to display the seal of the court-dissolved Cambodia National Rescue Party. A nine-year-old boy from Preah Vihear lost his fingers and vision following a mortar fuse explosion, while in a separate incident, a Ratanakkiri man sustained severe injuries on some parts of his body in a homemade grenade blast, authorities of the two provinces said. The National Assembly (NA) of Cambodia is going to host the Asia-Europe Parliamentary Partnership Meeting (ASEP), along with the Asia-Europe Meeting (ASEM) in 2020. The Cambodian Red Cross has donated a car, two scooters and cash to activist Ben Devis and the Tabos community as an incentive for participating in the protection of the natural resources in Preah Vihear province’s Phnom Thnout-Phnom Pok Wildlife Sanctuary. The Thailand Migration Report 2019 estimates that the country currently hosts about 4.9 million non-Thai residents, with some 3.9 million being documented and undocumented workers from Cambodia, Laos, Myanmar and Vietnam. Kong Korm has been appointed as Khmer Will Party’s honorary president, making him the first former opposition official to re-enter the political arena after his political right was restored. Ministry of Public Works and Transport (MPWT) has signed contracts with three Japanese companies for the improvement project of the central part of National Road 5 (NR5) from Thlea Ma-am to Battambang. The Supreme Court on Monday sent the case of a man convicted in absentia in 2016 for drug dealing back to the Appeal Court after the defence lawyer said a fake document was used to implicate his client. Supreme National Economic Council has formed a working group to draft digital economy policy for Cambodia. About 70-80 per cent of Vietnamese living in Cambodia have gained the country’s legal recognition that paves the way for them to obtain Cambodian citizenship, a Vietnamese official said. With the recent imposition of tariffs by the European Union, the local rice sector needs to focus on enhancing competitiveness by increasing efficiency and reducing costs, the Ministry of Agriculture said in a statement this week. I was born in Kandal province and I grew up and attended school in Battambang province. I studied mathematcs, programming and computing. 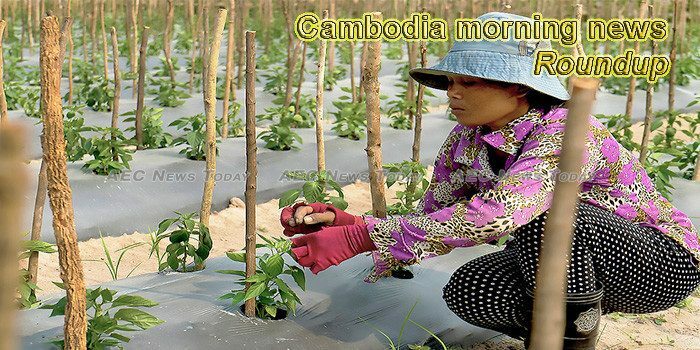 A General Directorate of Rubber report showed that Cambodia had exported 217,500 tons of dry rubber in 2018, up 15 percent from a year earlier. Despite experiencing rapid growth in the last few years, financial technology services in the Kingdom are still underdeveloped and underused, insiders said last week during the annual conference of the National Bank of Cambodia. Cambodian Prime Minister Hun Sen, on Tuesday, appealed to his compatriots to jointly preserve peace and prevent wars and genocide, writing on his Facebook Tuesday attached with six images comparing between Phnom Penh in Pol Pot Regime and Phnom Penh under his leadership. The Cambodia-China Cultural and Creative Park, a $70 million project in Siem Reap, will be completed in the next twelve months, according to the Chinese Consulate. The European Institute of Business Administration’s (INSEAD) 2019 Global Talent Competitiveness Index (GTCI) report, released earlier this month, revealed that Cambodia had managed to move up one notch in the rankings as a country for attracting and growing talent. The Ministry of Interior and the Cooperation Committee for Cambodia (CCC) are to conduct a census aimed at ascertaining the exact number of registered civil society organisations (CSOs) in the Kingdom, the ministry’s General Department of Administration director-general Prak Sam Oeun told The Post on Monday. Chinese tourists drove Cambodia’s tourism growth last year, with some 1.9 million Chinese holidaymakers visiting the kingdom, up from 1.2 million one year earlier, Cambodian Tourism Minister Thong Khon said in recent interview with Xinhua. Cambodia called on all foreign NGOs to operate in accordance with the legal framework and in compliance with the regulatory requirements that are in force, Prak Sokhonn, Minister of Foreign Affairs and International Cooperation addressed at the opening of Consultation Meeting with Foreign Non-governmental Organizations at the ministry on Tuesday. Cambodia and Russia have agreed to create a joint chamber of commerce to facilitate trade, according to a representative of the Cambodian Chamber of Commerce. Officials from the Cambodian provinces of Svay Rieng and Pray Veng visited Vietnam’s southern province of Long An on January 29, on the occasion of the upcoming Tet (Lunar New Year) festival. It is almost once again time for the annual Khmer Crafts and Food Festival (KCFF) in Phnom Penh. This rapidly growing event aims to promote Khmer culture as well as products that are totally Cambodian. From original artwork, to handmade crafts, traditional weaving, and of course food. His Excellency Prak Sokhonn, Deputy Prime Minister, Minister of Foreign Affairs and International Cooperation of the Kingdom of Cambodia, will lead a delegation to attend and co-chair the 2nd Meeting of Cambodia-Myanmar Joint Commission for Bilateral Cooperation (JCBC) from 31 January to 1 February 2019, in Nay Pyi Taw, at the invitation of His Excellency U Kyaw Tin, Union Minister for International Cooperation of the Republic of the Union of Myanmar, according to the ministry’s press release dated Tuesday. The Gold Tower 42 building had its last beam put in place on Monday, officially signaling the end of a more than 10-year construction delay that started during the 2008 global financial crisis due to a lack of funds. Gasoline is among the most basic utilities that affect the daily livelihood of people. While the price of gasoline in Cambodia is similar to other countries, the impact is different considering the income gap in the country.